Plyometric training gives athletes explosive power and strength in any sport. A sure way for soccer players to gain explosive power and speed is to do plyometric exercises. Plyometrics can help you gain an edge over your opponent. There's no secret to plyometrics and you don't need fancy, expensive exercise equipment to do this form of training. Plyometrics is simply jumping, hopping and bounding. This type of exercise stretches your muscles and then contracts them rapidly and powerfully, which increases your muscle strength and speed. As simple as jumping, hopping and bounding may sound, there are some important safety guidelines to consider before you start doing plyometric exercises. Always warm up before any exercise routine to prepare your muscles for more strenuous exercise. Do plyometric exercises before other workouts, such as strength or endurance exercises. Rest between plyometric exercises to reduce fatigue. Limit plyometric exercises to two days each week. Even though plyometrics seems simple, don't try to do plyometrics without proper instruction. Bounding is similar to taking giant steps, only with more energy. 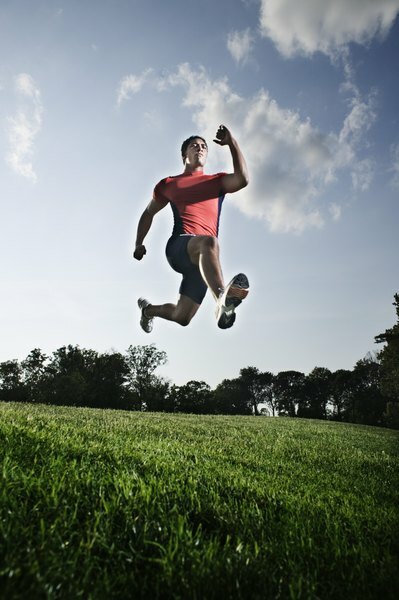 Bounding is a high-intensity plyometric exercise to help you develop strong, explosive jumping and running abilities. Start out by jogging and then push off on your right foot with as much power as you can while simultaneously stepping forward as far as you can with your left foot. Reach forward with your right arm at the same time. Next, push off with your left foot while reaching far forward with your right arm. 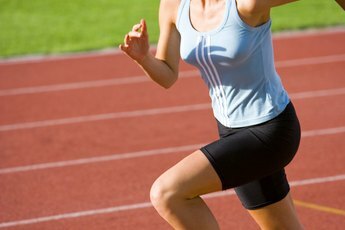 Try to maintain a long stride with each bounding step. Lateral jumps are a lot of fun. It may take you a while to build up your strength and endurance to be able to do more than a few repetitions of this plyometric exercise. Stand beside a bench or an exercise step-up box. Beginners should start with a short box or bench, about 12 to 24 inches. If the box is on your left, jump up and to the left so both of your feet land on the box. Jump off the box to the right, and then jump back onto the box to the right. Do three to five repetitions on each side. Drop jumps are not really jumping, but dropping from a bench or a box to the ground. Stand on top of a low bench or box. Drop to the ground in front of the box and then immediately jump backward back on top of the box. Drop backward off the box or bench and then immediately jump back onto the box. Drop off and jump back up on the box five times. When you get stronger and more agile, and you want to show off your jumping skills, try more repetitions.